If there is a reasonably large user population (unfortunate that the company went down and the Zeo doesn't work without periodic electrode replacement) it might be interesting to try to put together a database of extended Zeo information, mostly per-night rather than per-second. The above data, plus say melatonin (published research suggests that about 300 micrograms, 0.3mg, a few hours before bedtime help to synchronise the body clock), maybe the effect of various medications on duration of sleep phases, new mattress, evening avoidance of actinic (white) light (red lab goggles accurately designed to protect against blue laser light, use of warm (2700K) light sources, f.lux software? ), etc. etc. There would need to be some sort of agreed standard so that the database could be analysed, e.g. evening temperature and humidity (or recording over the night if available), dose and time of melatonin, maybe geographical latitude, etc. etc. etc. I don;t see this happening. I did some experiments with moon phase, nothing noticeable, though I have read of research that did find an effect. While Zeo was active, Amazon reviews like "it doesn't distinguish REM sleep from wakefulness" were indeed common; the reported Zeo response was always "everyone is different, if it doesn't work for you, return it for a refund". There was one long comment from someone who seemed to know what he was talking about, to the effect that the Zeo sensitivity was fixed to match the population average; some people had stronger or weaker waves than average and Zeo didn't work for them; they wanted some sort of internal sensitivity adjustment. If Zeo had continued, there would probably be hardware hacks for this sort of thing. Well, I've opened one my unit up very clumsily with a kitchen knife because the battery doesn't take charge, and the battery that is inside is a PP312122AB 3.7V Li-polymer Rechargeable Battery. Unfortunately, other than a picture, I can't find one for sale or any more information on it (such as current, capacity) that would enable me to get a replacement. It's very tiny, measuring 2 by 2 cm. Any ideas on what I could do? The pictures can be found via Google. Most of these sites seem to have a minimum order of around 10,000; this site says "MOQ: 1", price US$0.90-1.50. I have absolutely no idea if you could actually get just one, or if it will fit and work. Th other thing you can do is look for a battery that can be pressed into service. I'd start with a round coin battery as they're standard. The CR2032 size (20mm dia, 3.2mm high) is popular for computer memory backup, it's not rechargeable but it'll give you an idea of size. Other prefixes are used for rechargeable versions; sometimes there are several slightly different ones, but there aren't nearly as many as disposable type. So I'd check space and consider a rechargeable battery with a lithium technology (Li-ion, Li-polymer and others are more or less interchangeable) that'll fit in the space, with solder tags. Capacity is a possible problem. I guesstimate the capacity of the original battery, given its size (and I don't know the thickness) at 150mA. I vaguely remember testing a transmitter's battery life, placed close to a bedside receiver: about 16 hours (I may be wrong). If this is about right, we would need a battery of at least half the capacity of the original (and remember that capacity decreases as the battery ages). In principle a button cell with solder tags could be used, but the actual sizes available, as far as I know, are a problem: Farnell has the ML 2032 T17, 20mm dia, 3.2mm high, which will fit, but provides 65mAh, not enough or barely enough; and the bigger LIR2450, 24m, 5.0m,, 120mAh, that probably won't fit. The other alternative is to fit a larger battery and improvise some sort of case, forget the original. I hope somebody can come up with better news. It would be useful to know, once you have managed to open the case, how it is clipped together, so that maybe it can be opened non-destructively. Is it glued? You raise a lot of good points here. Firstly, this is my first foray into anything to do with any kind of batteries or electronics, so you're not speaking to an expert here. To answer your last question, as I say, I did crack open the case with a kitchen knife, but it hasn't given me much of a clue it it could have been opened more easily. I mean I'm sure it could have been done more carefully, without doing any damage to the case, but at the end of the day, while there are two tiny plastic pins that go into tiny holes there, and while it appears to "clip" to some extent when I tried to reassemble it I think that the case is ultimately held together by glue, as you suggest. The person who does it next (I hope it's not me again trying to open another faulty unit) should try suction cups as a matter of first resort. As for the batteries you suggest, none of the would fit. Sorry I forgot to mention the thickness, but it measures at only 2 mm. Maybe a slightly thicker battery would fit without pressing too hard on the electronics. Also, can I ask, when you say that the first thing after removing the battery is to test it, how exactly would I go about testing it? What kind of equipment would I need to use and what would the readings reveal? I know you can measure the battery's voltage with a voltometer, but can you measure full and remaining capacity? Here's a post I wrote on an Instructables page which should explain the situation with the battery to a greater extent. This post deals which restoring the original battery. I understand that this may cost more in equipment than buying a new unit, but I may give it a try just for the sake of it and seeing that it's a problem that Zeo users may run into in the future. All I know it's a 3.7V battery. It measures 2mm by 20mm by 20mm. Unfortunately, one is not available for sale and a replacement would also be hard to find. So I'm wondering whether it can be restored. Because it's supposed to be charged for 3 hours and the writing on the charger says 5V-0.5A, I worked out that the capacity of the battery is 0.5A X 3 = 1.5Ah. However, I cannot imagine such a small battery having such a large capacity. Usually batteries of this size have a capacity not exceeding 0.1Ah. I know that my only chance of restoring this battery is using a micro charger which can produce currents as low as 10mAh. Moreover, the wires from the battery seem to be soldered onto the electronics board, rather than connected. I would imagine that to connect the wires to a charger of any sort, I would have to break off the wires and fit them into a JST plug, which is another thing I don't know how to do. Finally, when it comes to soldering the wires back on, the whole thing is on such a micro scale that even if I was familiar with soldering (which I'm not), there would be a great risk of damaging the electronics board. Do I have a chance of recharging this battery? Although I don't know anything about the batteries on these units having never looked, I just wanted to correct your misunderstanding about current. The fact the battery charger says 0.5A says nothing about what the battery can take, and you don't need a small charger to charge it. As you say it is very unlikely a battery of that size can be 1.5Ah. Unlike voltage, current is a limit, therefore if you are charging a 3.7V battery, it doesn't matter if your charger can give 0.5A or 1000A, it will charge at exactly the same rate, and assuming the battery needs less than 0.5A, the same current will go into it. As to the other matters, if it is soldered to the board, then your options are limited. You can measure what the voltage is when it is on charge and if it gets up to the 3.7v, and how quickly it discharges, but to do much else you would have to either unsolder or cut the leads off. Thanks @tolerant for your information, very useful. I won't quote in full to keep things short. You report that you've opened your non-charging Zeo (mobile phone version) transmitter and are looking to get it working (details on the quantifiedself "Zeo shutting down: export your data!" thread a few posts up). Batteries are usually soldered into such assemblies, and must be unsoldered for replacement. Be very careful not to heat the battery itself significantly. If you are not accustomed to solder work on miniature equipment you may cause damage to the circuit board. It appears impossible to get a replacement battery that will fit in the transmitter and supply sufficient energy for a night. Maybe somebody will eventually find one? The external volume of the original battery (20x20x2) is about 80% of that of a rechargeable ML2032 (20mm dia, 3.2mm thick, 65mAh), which suggests ~50mAh for the Zeo battery. 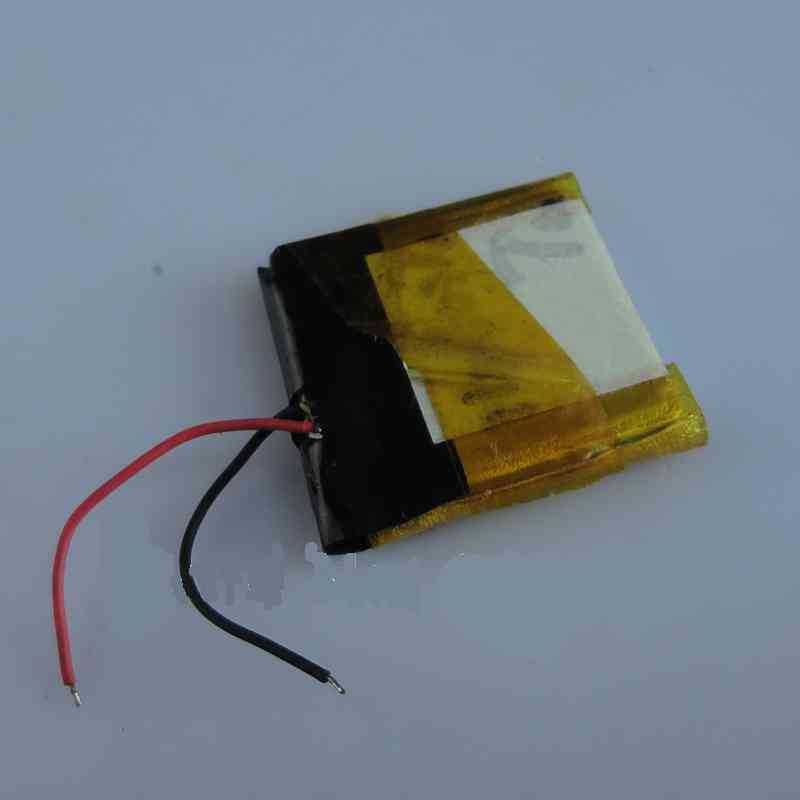 You can replace the battery, either temporarily for testing or permanently, with a larger Li-ion or LiPo one of the same voltage (any single cell will be rated at 3.6-3.7V), being extremely careful not to short-circuit it in the process. If permanent, you'll have to improvise a casing. Capacity needs to be at least 50mAh, maybe a bit more if I've underestimated, but a somewhat larger capacity doesn't seem to be a problem (it might take longer to indicate full charge, but should last a night even if not full). I'll post a summary of information on the battery below, for reference. and quotes and uses information supplied by quantifiedself member "tolerant". There is discussion at quantifiedself of ideas on testing and replacing the battery. (much edited quote): I've opened my unit with a knife because the battery doesn't take charge; the battery is a PP312122AB 3.7V Li-polymer Rechargeable Battery. Square, size 2 x 20 x 20mm, non-standard, not available. This hasn't given me much of a clue how it could have been opened more easily. I'm sure it could have been done more carefully, without doing any damage to the case, but at the end of the day, while there are two tiny plastic pins that go into tiny holes there, and while it appears to "clip" to some extent when I tried to reassemble it I think that the case is ultimately held together by glue. The person who does it next (I hope it's not me again trying to open another faulty unit) should try suction cups as a matter of first resort. The charger is rated 5v 500mA. The external battery volume (20x20x2mm) is about 80% of that of a rechargeable ML2032 (20mm dia, 3.2mm thick, 65mAh), which suggests ~50mAh for the Zeo battery; this is an estimate only. From memory, I think that the battery of the clock version runs for about 16 hours on a full charge, and takes about 1 hour's charging (not 3) until the display indicates full charge (I tested these times). This may vary between units, and my recollection may be wrong! A comment about lithium technology (Li-ion, LiPo) rechargeable batteries: I believe that lithium cells are very susceptible to damage by either over-charge or under-charge. This is avoided in equipment by circuitry that does not allow these circumstances. Lithium rechargeables self-discharge only very slowly, so that they may be left for long periods; however they may eventually self-discharge below the safe limit and become unusable if left for long enough. It is not safe to try to rejuvenate them in an external charger without protection circuitry. I don't know if this form of damage actually occurs from personal experience; but I have a spare transmitter, and swap the two occasionally to avoid the possibility. @woodinblack, how exactly would I measure the voltage of the battery, whether or not it's on charge? Do you mean with the case of the transmitter open or closed? Can I use the gold-coloured "things" at the bottom of the transmitter to measure the voltage remaining on it? If not, can I use the points on the circuit board to where the battery wires are soldered to measure the voltage? As regards the 0.5A written on the charger, I don't know what it could be referring to. A LiPo battery should not generally be charged at higher than capacity. Assuming the Zeo battery has a capacity of 50mAh, it could safely only take 50mA of current when charging. @pol098, I know that when trying to restore LiPo batteries you need to watch them closely and have a LiPo fire/explosion-proof bag. You're right that the battery is soldered onto the circuit board, and unsoldering and resoldering it could easily damage the circuit board. Maybe an easier way would be, if I was seriously thinking of restoring the battery, to cut the wires at about half-way point and after rejuvenation is complete, to reconnect them by soldering. 1: the zeo machine says that all of teh data is 0. zq, total z (which is fine I was awake) will not display any data or graph, it says no data to display. I was awake the whole time just tryingto gather data. 2: I have sleep apnea and upload my data into a program named sleepyhead. It is expecting a csv file. When I try to upload the file from the viewer it kills sleepyhead. I will try to gather data tonight and see what happens. I have read through all of this 19 pages of post, and there are several ways of viewing the data. what is the best way to get a csv file that matches the file from zeo? is there any suggestions on why there is no graph, it should show the awake graph? I did see graph data while it was being collected. woodinblack, how exactly would I measure the voltage of the battery, whether or not it's on charge? Do you mean with the case of the transmitter open or closed? Can I use the gold-coloured "things" at the bottom of the transmitter to measure the voltage remaining on it? you need to measure the voltage at a point where it comes from the battery, either the terminals, or some point on the board where the power exists, so the transmitter would have to be open, unless you can run some leads outside of it. If not, can I use the points on the circuit board to where the battery wires are soldered to measure the voltage? As regards the 0.5A written on the charger, I don't know what it could be referring to. A LiPo battery should not generally be charged at higher than capacity. Assuming the Zeo battery has a capacity of 50mAh, it could safely only take 50mA of current when charging. Yes, the points on the circuit board. The 0.5A written on the charger is the maximum current output of the charger, before the voltage dips. So the charger can give any power up to that amount at the specified voltage. The 50mAh on the battery doesn't indicate how much current the battery can give or take, it indicates the actual capacity, so it could provide 50mA for an hour, or 100mA for 2 hours or 50mA for 10 hours. This is only a rough measurement as other factors are in play, but that is the basic idea. From my initial working on the viewer (and I guess you are using 0.2.6b?) it displays data from the epoch preceding the onset of sleep. So if you don't sleep it won't show you anything. Try going to sleep and seeing it. This program is very flakey though, so don't hold your breath too much! There are a few sleephead users on this forum, I believe that sleepyhead used to load csv files from zeoviewer but now doesn't, so maybe an older version would work but that is just second hand info. Obviously whatever you gave it was not what it was expecting if it crashed. the zeo doesn't produce any csv files. My application exports CSVs, in a very similar format as the original Java viewer, if that is what you need, but again, if it crashes sleephead in that format it won't make much difference. Did you backup your data before you updated? My application can deal with encrypted or unencrypted, or both in the same file. how exactly would I measure the voltage of the battery, whether or not it's on charge? ... Assuming the Zeo battery has a capacity of 50mAh, it could safely only take 50mA of current when charging. Anywhere where the two terminals of the battery are connected, wherever it's most convenient. If there's a wire soldered to the circuit board going to the battery, the solder point is fine. If the battery terminal is exposed rather than insulated, also fine. Any solder pad on the circuit board connected to a terminal, also. Use a multimeter set to the appropriate voltage range. It's possible that you get a measurable voltage across the charging contacts on the transmitter related to the battery voltage; if you hadn't already opened it I'd have suggested probing the contacts immediately after the 30-second-lasting charge to see if there's a voltage that decreases rapidly. Avoid bridging or short-circuiting any connections when applying the probes. Maybe an easier way would be, if I was seriously thinking of restoring the battery, to cut the wires at about half-way point and after rejuvenation is complete, to reconnect them by soldering. Whether you try to rejuvenate or test, or simply replace the battery, you'll have to disconnect it. For a battery connected by wires rather than pins through the board, cutting them is often the best way. It also makes replacing easier (if you don't cut the wires too close to the board), unless the assembly is so tiny that's there's no room to pack in soldered insulated joints. Regarding the charger current rating: it just has to be capable of delivering the required charging current, higher rating is fine but ignored. I've found the Zeo battery seems to indicate full charge in about 1 hour (if memory serves, I did check it long ago), so the actual charging current is probably about 50mA (it would be, say, 5mA for a 10-hour charge, and so on). Any charger that can supply AT LEAST that current is fine. The manufacturer would buy a standard charger; 0.5A at 5V is simply probably the cheapest these days. If you want to fill tiny medicine bottles with water, you wouldn't install a special tap that delivers a trickle, you'd just use an ordinary tap turned on just enough to deliver a trickle. The primary differences as far as the CSV export is concerned is that the original contained the 5 minute hypnogram (used by SleepyHead) and Woody's contains the 30 sec hypnogram data only. If there is enough demand, perhaps the author of Sleepyhead will incorporate the 30 sec data hypnogram into the program. The 30 sec hypnogram presents much more detailed information and is better suited for use in SleepyHead than the 5 minute hypnogram was. BTW, it is difficult to test Zeo by wearing the headband while awake because it does not start recording until after a sleep stage has been determined. I can not determine from your post which method you are using to retrieve your Zeo data, but if you're not using Woody's viewer referenced above, you should. Thanks, I have teh bed side model. I was able to get a full nights data and the ze is working normally. I do have woody's viewer and it looks good. I got in tough with the sleepy head developer and asked if he could look at the difference in the CSV files. I will pass on to him that the main difference is that the new file had data at 30 second intgervals, not 5 minutes, that make it an easy fix. I got in tough with the sleepy head developer and asked if he could look at the difference in the CSV files. I sent Mark an example of both the old and new CSV files. I'll send you a copy by email. Thanks guys for your input on the battery issue. I did measure the voltage at a number of places, and every reading was exactly zero. I used another 3.7V battery as a reference to make sure there was no issue with the voltmeter. I haven't tried to measure the voltage when the unit is charging or immediately after taking the battery off the charger. I think trying to rejuvenate a zero volt battery would be an expensive and difficult tasks, considering I don't have the required equipment or skills. It should be much cheaper and easier to find another battery that fits into the unit. For that I'll have to do an estimate of the thickest battery the unit will possibly take and see if one is available. If I do find one, I'll write an update. I’m sorry it took a little time to reply. ResMed did acquire some of the Zeo assets including intellectual property. The anonymised sleep data were used to make comparisons with our extensive research on the sleep norms and various meta-analyses of sleep data during development of S+ by ResMed. We have not reconstituted the Zeo platform. However, we are planning to offer a unique program to former Zeo customers (available in the US initially) so that they can build new data quickly and easily with S+. In the meantime, we love the vision that you and the QS movement have shown and want to do all we can to support healthy sleep. The anonymised sleep data were used to make comparisons with our extensive research on the sleep norms and various meta-analyses of sleep data during development of S+ by ResMed. Thoughts about releasing the Zeo data? From the sound of it, you have no further use for it now that you'll be getting additional data from S+ users. Gary, would it be possible to PM me the contacts for Gary? I use a resmed CPAP machine, since this is infering sleeping patterns from breathing, I want to see if they could build some if into their CPAP machines which measure the resperiation directly. I also understand if this is not possible. I made an interesting discovery of possible interest to Zeo Mobile users. Upgrading to iOS 8.1 on my iPad 3 brought back "Sleep History" functionality on the Zeo iOS app. Tapping Sleep History crashed the app in iOS7, but on my device the histograms are back in iOS8! I had prepared myself to lose all functionality, so this was a happy surprise. I have a similar problem with 3D Vision glasses, and a dead battery. These are LiPo batteries as well. Based on my reading and understanding of batteries (EE background, not totally guessing. :s) you should be able to replace the LiI/Po battery there with something used for RC planes. All the batteries are very similar, the 3.7V is the key. Do not under any circumstances replace the battery with a coin-cell or anything not LiI/Po because there is a charging circuit there that will interact badly with non-chargeable batteries. NiCd, NiMH are the wrong voltage and will not work. It's possible battery itself has a circuit board, that's how the 3D Vision glasses work. But your description of the tabs being soldered to the board itself suggest that it's a stock LiI battery, and that the overvoltage protection is provided by the headband circuitry. This is what I would expect design-wise. Here is a post regarding battery replacement in the glasses, and has some detail about sourcing the LiI battery. I think Martinus nailed it with that link above. You should be able to just solder a new one on the board. In terms of soldering in a new battery, that is going to be very easy for someone with a little experience. Without experience, you'd be better off to find a local tech-shop of some form, or DIY group, or MakerFaire type people who can do this in their sleep.